A sermon preached on December 2, 2018 — the first Sunday in Advent — based upon 1Thessalonians 3:9-13. I am asked on occasion how I manage to write our Christmas plays, and the answer I give is that hopefully by July some kind of seed image captures my attention and with this starting point my imagination goes to work conjuring up characters that my actors could embody. Gradually certain themes and a plot begin to emerge. This year my seed image was of a bus load of strangers together on a bus on Christmas Eve. A theme of “going home” naturally arose from this image – of homesickness and what it means to be truly at home in this world. I was talking to some of the youth in the cast and they took note of the fact that all of the characters in the play had experienced some degree of fracture to their sense of “home”, whether by death, or divorce, or by having been uprooted from the place they called home. When I thought about it, I realized that fortunately –unlike the characters in the play most of the kids performing in the play have been blessed by a pretty stable sense of “home” in their short lives — a part of which has included their feeling of being “at home” in the community of our church. My own childhood included some measure of fracture and several moves, and one of the reasons I have been here for nearly 30 years is the sense of a “home” I have found here. My hope for my young cast members acting in a play about characters who have known greater fracture in their sense of “home” is that they will a) feel more compassion for people have had to endure such things, and b) they will feel more gratitude for what they have been given but perhaps taken for granted. Parents, you’ll have to let me know if the latter is the case. Unfortunately, we human beings have a tendency to not fully appreciate what we have until we either lose it or at least experience the threat that we might lose it. Over time no home on this earth is immune to the fractures of which I speak, for the power of death in all its forms eventually disrupts the bonds we so cherish. This morning we are blessed to have Mehmet and his family with us. A few months ago they opened their home to several of us to share with them a Ramadan fast breaking meal, and this morning they have brought us a Turkish treat known as “Noah’s Pudding” to share with us during coffee hour. I am mindful of the fact that our friends are here in the United States because they were driven out of their homeland by a brutal dictator who has arrested thousands who opposed his drive to power. 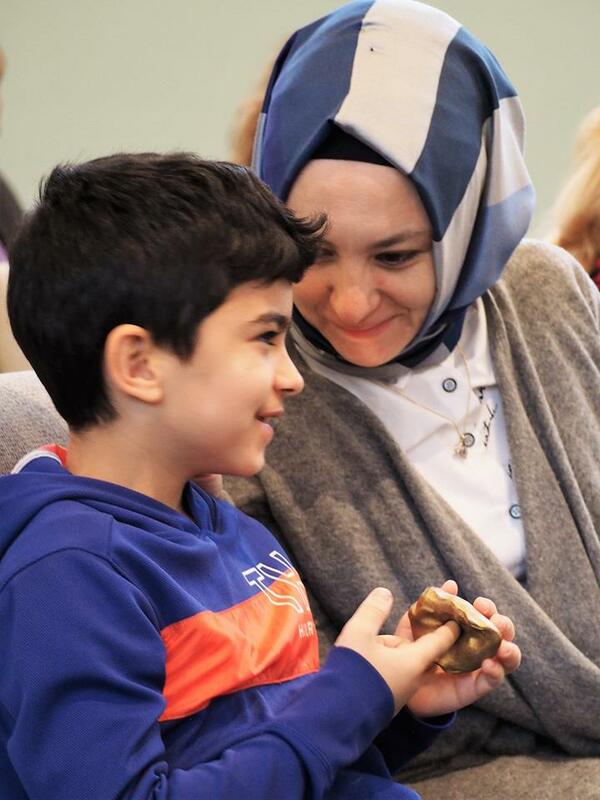 Mehmet’s family practices these traditions of their homeland to help them regain a sense of being at home in spite of having been forced out of the place they called home. First, a little background on Paul. For the first half of Paul’s life he was known as Saul of Tarsus, rooted in a particular place and the particular set of traditions practiced in Judaism which provided for him a strong sense of belonging in this world. His world however got turned upside down with his encounter with the glorified Christ on the Road to Damascus when he experienced a love wider and broader than any single tradition can contain. In a peculiar way the experience left Paul as a man who “couldn’t go home again.” He felt a call to spend his life on the road sharing the wonder of what had been revealed to him of God’s love in Jesus. He made three long missionary journeys through the land north of the Mediterranean. In each city he entered he would go to the local synagogue where he would share the Gospel he had received. Typically there were some who were open to what he had to share, sometimes Jews but more often Gentiles who were attracted to the religion of Judaism with its ancient traditions and its distinctive monotheist faith. With the few who responded Paul would form a fledgling church after which he would move on to another city, often driven out by those hostile to his reinterpretation of the Jewish tradition. Such was the case with the city of Thessalonia which Paul visited on his second missionary journey. The relationships he cultivated in his time there deeply touched Paul’s heart and he expresses in our passage his longing to visit them once more. We don’t know if he ever had that opportunity, but we do know that in his concern over the welfare of the young congregation Paul had sent his associate Timothy to visit Thessalonia and Timothy had returned to Paul with the news that for the most part the folks there had held up quite well in the faith. There was however something that was troubling to the believers there. Part of their belief system included a conviction that Christ would return shortly to truly restore the sense of home in the deepest sense – to bring the fulfillment of the Kingdom of God. But as the years passed, folks they had loved had died and they worried that somehow in dying before Christ’s return these beloved ones would not partake in his great homecoming – that these cherished people were in some sense lost to them forever. Paul assured them that they need not worry, that God’s love was more powerful than death, and that they would one day all be one. In the meantime he encouraged them to focus on the deepening and widening of their love: “And may the Lord make you increase and abound in love for one another and for all” – love not just for their brothers and sisters in the church, but for all people – whomever it was God placed in their path. As I began writing my play about homecoming, the popular song, “I’ll Be Home for Christmas” soon came to mind, and I realized somehow I should incorporate it into the play. I ended up stealing the title of the song for my play. You may be familiar with the history of the song. It was written in 1943 at the height of World War II and the recording of it by Bing Crosby became an instant hit. Anyone alive at that time in our history would have instantly recognized that the song is essentially a letter home by an American soldier overseas fighting fascism who finds himself homesick as Christmas approaches. The song hit a chord. At USO concerts it was always the most frequently requested song. Curiously though, the BBC – the British Broadcasting Company – refused to broadcast the song. The management feared that the song would take a toll on the morale of the British troops, inducing a homesickness so strong that they would lose the will to fight the war. This begs the question: Is “I’ll Be Home for Christmas” an upper or is it a downer? Though the words are repeated, that’s the entire song. There’s this striking tension in the lyrics. Through the vast majority of the song it expresses great confidence that the one singing the song will “be home for Christmas.” He requests that his family make sure to carry out the traditions that remind him of home at Christmastime — that there be snow on the ground, and mistletoe and presents ‘neath the tree. In the final line, however he seems to acknowledge the reality that in all likelihood he won’t actually be physically home for Christmas. It occurred to me this week that “I’ll Be Home for Christmas” is a very good Advent Song. The season of Advent calls our attention on the tension the song expresses. On the one hand, in the story we tell at Christmas we marvel that in Jesus God has made God’s home among us here on earth, taking on flesh, being born in what might have seemed like the most God-forsaken of places – in a stinking stable to a poor, homeless family of refugees fleeing a brutal dictator. God has made God’s home with us and so now anywhere we find ourselves is a place we can anticipate the presence of God. God has already arrived. And as we wait, we seek to bear witness to the lovelight that has shown in our lives — to open ourselves as the Apostle Paul says to God’s intention to grow the love we have for one another and for all people in this world – to prepare our hearts that we may be a safe place for the child of Bethlehem to be born yet again.